Riot have been running a refer-a-friend scheme in one form or another since League of Legends launched half a decade ago. The current system rewards players who introduce others to the MOBA with new skins – but will soon be revamped to tackle a growing problem with botting and account selling. The existing system asks players to refer 25 friends for the Grey Warwick skin, and 50 for Medieval Twitch. That’s proving to be an insanely large number – the sort of high-hanging fruit only botters are reaching, in order to sell on accounts pre-loaded with currency and skins. Ironically enough, that’s ruining games for newly referred LoL players – so Riot are working to “remove incentives for abuse” from the refer-a-friend program. The vast majority of League players refer between one and five friends – so the new system is designed to serve only them. 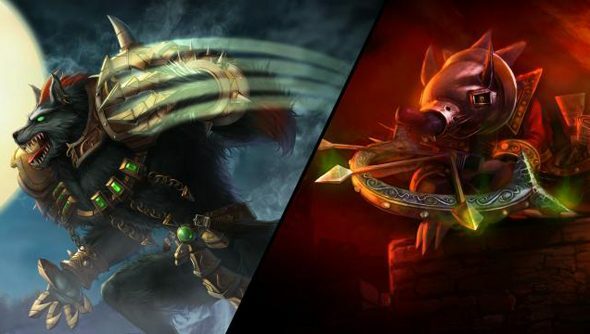 After an imminent update, players who successfully refer three friends will unlock the Grey Warwick skin, and Medieval Twitch if they recruit five. What’s more, they’ll earn 1000 IP for each referred friend that hits level 10. There’ll be no rewards for referring dramatically high numbers of players, and hence no reason to set up a script to do so. In the meantime, Riot will plough ahead with “reactive efforts” – namely bans – to tackle the minority of “dedicated and repeated offenders” already abusing the refer-a-friend system. Will you be happy to see this sorted? Or are you preoccupied with those preseason jungle changes?